TiltTurn window handle Hoppe aluminium Paris series on oval rose. 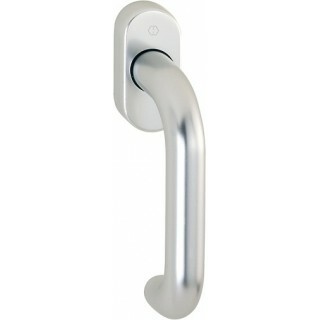 Window handle Paris series, manufactured by a renowned company: Hoppe. Paris handle appears simple, with oval rosette of 72 mm in length and a handgrip with 'tail' towards inside. Available in aluminum silver or bronze. Provided with Secustik burglar resistant technology.